This is a NVME to NGFF M-KEY Adapter Card. It ocnverts U.2 to M.2 PCI-E. 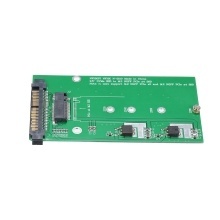 Convert SSD with M-KEY NGFF to SFF-8639 interface. ONLY support M-KEY. NOT support B-KEY or B/M-KEY. It has PCI-E 4X interface and SATA power supply interface.